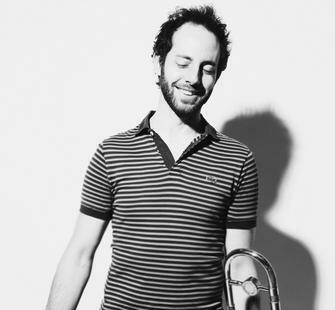 Alex Asher is a trombonist, improvisor and composer living in Brooklyn, NY. He is the bandleader and primary songwriter for polyrhythmic, indie-soul band People’s Champs, which has performed at BRIC Celebrate Brooklyn! Festival, The MoMA, The Guggenheim and toured throughout the USA. He also leads Los Cumpleaños, an experimental collaboration between musicians from Colombia, Argentina and the USA. Alex co-leads The Superpower Horns, studio horn section for Beyoncé Knowles and touring horn section for Boy George & Culture Club, amongst others. The group wrote and arranged the horn lines on Grammy-award winning songs from Beyoncé’s 2011 album ’4′. Alex was a U.S. Department of State-sponsored OneBeat Fellow in 2014, where he collaborated with 24 other emerging musical leaders from around the world to create original work and develop a global network of civically engaged music initiatives. Alex performs with many groups including M.A.K.U. Soundsystem (Experimental Afro-Colombian), Porfi Baloa y Sus Adolocentes (Salsa), Slavic Soul Party! (Jazz/Balkan), Super Mambo (Latin), Super Hi Fi (Dub/Jazz), Williamsburg Salsa Orchestra (Indie Latin), John Brown’s Body (Reggae), The Superpowers (Afrobeat/Jazz) and many others. He’s performed at traditional Irish jam sessions throughout Ireland, jammed with Roma brass musicians in rural Serbia and marched at Carnival in Rio de Janeiro, Brazil & Barranquilla, Colombia.